Dee and Angie argue over the wedding. Dee tells Toadie, she just wants their wedding to be perfect, but he tells her it's not important and only she and he matter. Toadie and Dee are practicing their dance, they agree to count themselves in and then go with the flow, which they manage to do. As they dance, Stonie creeps in on them, causing Angie to come screaming through. Stonie tells them to cut the dancing/kissing and save it for the honeymoon. He tells them of the bets they have going and that Kev reckons they'll last 70 years with 10 kids. Toadie tells him Dee isn't a Labrador, and they end up in a petty punching fight. Angie tells them to cut it. Joe is on the phone to Lyn who tells him that they are on their way home, but that she's not looking forward to talking to Henry; they hang up. 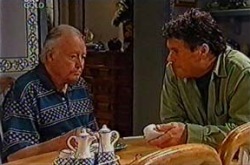 Joe tells Henry that now Lyn's discovered a few things, she'll want to sit down and work out what's what. Karl is making himself a lettuce sandwich, but Susan tells him that no one eats lettuce sandwiches, apart from the time your mother ran out of money, but that no one actually eats them. She looks through the facility bills and points the odd one out to Karl; he blames the high values on Libby complaining that she never turns the lights off etc. He complains that they have no money because of what Cameron Fodder has done to him, and that now they are skint and it will take them years to pay back. She tells him to just eat his sandwich. KARL: Is it wrong to suggest that we should tighten our belts just a little? KARL: Is it unreasonable for me to point out we are throwing money down the sink? SUSAN: I will happily walk around the house in the dark and eat nothing but mashed potato for a week, if you stop flapping your gums and eat your sandwich. Toadie, Stonie and Angie tell Connor and Dee the story of when the new priest got arrested. Angie welcomes her to the mad house. Toadie asks Stonie how he's going. Stonie tells him it's same old same old, with the odd footie and the burger flipping, with the family business. Angie tells Dee not to worry and she won't be flipping burgers as she's marrying a good'un. Susan comes in and orders a bottle of Riesling, but Karl tells her that it's probably best that they go for the house white. Susan insists on the Riesling, but orders a glass of water for Karl, telling them not to wash the glass out as it'll waste water. She orders some menus and they go to sit down. Karl asks why they can't just go home, and that he's prepared to cook. She tells him they've only got two carrots and an artichoke from about six weeks ago that he said he'd 'do something with'. Karl starts complaining about the wedding presents, and asks why they had to get the carving knives when they could have got them salad bowls. Susan reminds him that they were plastic. Joe is warning Henry that Lyn might have a few harsh words to say when she returns. At that moment, Lyn and Valda appear, Henry starts asking them how Shelley Bay was and if it still had the same fish and chip shops. Lyn asks Joe and Valda to give them some space. 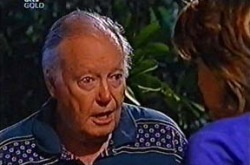 Henry continues to talk about the Bay, but Lyn stops him and tells him to sit down. LYN: You stole me from my real mother. Henry starts to come up with a lot of excuses, but it is soon clear that he gave Charlie a choice between staying with Valda or not. 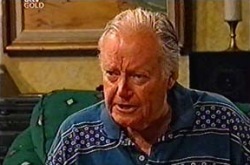 Lyn reminds Henry that Charlie and Valda were going to marry until he disappeared. He tells her he was trying to do the right thing for them all, and still believes the same now. She asks if it had anything to do with the fact that he and Connie were able to have a child of their own. She tells Henry that her real father is dying in hospital and that he won't get to see his grandchildren grow up. She tells Henry she doesn't want him to get to know her unborn child. Connor and Stonie are planning Toadie's buck party, with a stripper, a full body shave and a trip to the tattoo parlour. Angie comes in and reminds them that Toadie isn't one of their mates from the footie club, but a respected lawyer, and they are not to touch a hair on his head. Toadie smiles at them. Connor and Stonie agree that perhaps the standard tying to a lamppost might be the best idea. Dee delivers the guys a beer each and leaves. Toadie tells them a few ground rules, no full shaves, body or otherwise and yells out 'no strippers' but nods his head and grins at them. Joe asks Lyn if she feels that she's being a little unfair on Henry. She reminds him how Henry had lied to her all her life and then eventually when the truth came out, made it sound like he was the hero who saved Valda, not the one who stole her child. Joe reminds her of the time she helped him clear things up with his dad; he asks what's going to happen when it comes for Henry to die. Is she going to let the man who raised her, go to the grave alone? She goes to put the kettle on. Dee and Toadie are getting ready for their last night's as single people. They've both picked old tops in the hope that it will encourage the others to be nicer to them. Dee tells Toadie not to let the boys go too far, and to set some ground rules. She mentions that she hopes she's getting the same stripper as Susan had on her hen night as he was 'hot', but not as hot as him of course. Toadie tells her to enjoy her night, and she says she'll see him at the wedding, as she's agreed a room at Susan's. He asks if she's serious about not spending the night together, she tells him she is; but he asks who he's going to share their nice big bed with. Connor and Stonie are playing on the game box, Stonie asks when did Toadie turn soft, and become scared of a good night out. Angie comes through and tells Stonie that his brother has grown up unlike some people and there is no need to get wasted at a buck's night. Stonie questions the point of having one if that's the case, but Angie tells him it's a celebration of a stage in his life. Connor beats Stonie in the game! Karl is still complaining about the wedding presents situation. Susan reminds him how they housed the boy for a while but Karl still reckons that they should spend a reasonable amount. Toadie creeps up behind Karl and asks if he's ready for the night out. Susan mentions that she should get going and Toadie asks her to make sure they all behave around the stripper. Susan tells Toadie she has no idea about a stripper and instead welcomes Stonie back. She asks if he's still studying, but he tells her he packed it in for a burger flipping job and has not much chance at either a job or a love life. Over at the bar, Stonie tells Toadie how he thinks he's done well for himself, since he left Colac. He tells him how he's still down at the same bar, drinking with the same mates and living at home, but Toadie asks him what the big deal is, he flips burgers while he flips papers. He tells him to stop feeling sorry for himself. The rest of the guys arrive and the party begins. Susan offers Angie and Dee something to eat, but the party is a bit dull with just the three of them. Susan tells Dee that Steph and Libby should arrive very soon, and in the mean time they crack open some champagne. Angie suggests that perhaps they should take her down to town and get her dressed up. There's a knock at the door, but it turns out to be Lyn, who comes to apologise to Dee that she won't be able to make it. 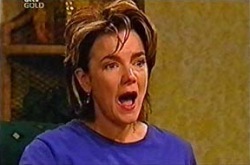 Angie suggests that perhaps Steph and Libby are organising the stripper, but Dee says she's OK with a quiet night in. The guys are playing a best burp competition, but Karl's efforts with orange juice do not impress. Instead they turn to advice. Stonie tells him that once married all he'll drink is cold tea, and to simulate a hangover, drink a glass of washing up liquid in the morning and to apply his head to a wall liberally. Connor tells him never to cut his own hair after eating two margaritas, whilst Karl tells him the only words he'll need to know are 'I'm Sorry' and 'you were right'. As before it doesn't impress the lads, and Karl is forced to buy the next round. Valda catches Henry checking out of the hotel. She asks if he's leaving and he tells her that she's got her girl, as there's nothing he can do to win her back. Valda tells him to stay and work things out with Lyn, tell her how he really feels, but Henry tells her that he's already done that. She tells him things will be different when Lyn's calmed down a bit and it would be a shame for them to fall out completely. She asks him to stay for the family's sake. Lyn opens the door to Henry. HENRY: I won't hold you up, I just have to say, I guess I pushed everyone around at the time, but I just wanted you all to be happy, I thought I was making things right. I didn't think I'd be causing all this pain. I'm sorry I can't fix things like I did when you were little, but you've got to believe I've always loved you like my own, and I always will; and that the thought of loosing you hurts, but if it's what you want, I give you my word, I won't contact you again. I'm on the morning bus, it would be nice if you were there to wave me off. Bye love. He leaves. Lyn closes the door and cries.